The map gives a quick overview of the numbers of women from 110 of the 130 first-built workhouses. This map was complied by Dr Trevor McClaughlin and appears in his book, Barefoot and Pregnant? Irish Famine Orphans in Australia, Volume 2, the Genealogical Society of Victoria, Melbourne, 2001, p.79. Throughout the 19th century Ireland saw an exodus of people to all corners of the world especially to the colonies and former colonies governed by the British, in particular to Canada, United States and Australia. These countries are often referred to now as the Irish Diaspora. The majority of those who left Ireland during that period for Australia left in because of economic circumstances in Ireland and the lure of a better life. The rebellion of 1798 saw many Irish men transported to the penal colony of New South Wales. Minor famines or ‘subsistence crises’ contributed to numbers leaving over the next forty years, but these numbers were small compared to the numbers who left Irish shores during the Great Famine (1845-1850) and its aftermath. Post-Famine Irish immigration to Australia was very significant with some writers claiming that over 30,000 single Irish women alone arrived over a fifteen-year period between 1848 and 1863. In a male dominated society, these numbers altered the demographics of Australia in a very significant way. There are also claims that 30% of Australia’s present population have some Irish blood in their veins. If that is the case, then you may be returning to this site many times in the future. The Australian Famine Monument is a memorial to the million or so who died during the Famine period. It is a monument to those who survived and, in a very special way, to the 4114 Famine ‘orphans’ who arrived in Australia under the Earl Grey scheme between 1848 and 1850. It is a monument to their success, and recognises their contribution to the building of this great country. The information on the website mainly concerns these women. The site will be updated as information comes in. In fact, if you want to have a profile of your orphan ancestor printed on the web, this can be arranged for a small fee of $20.00. The Australian Monument to the Great Irish Famine is situated in Sydney, in the grounds of the Hyde Park Barracks Museum and thanks is extended to Sydney Living Museums (Historic Houses Trust Ltd) who is the custodian. Do you know any of their stories? Further information can be researched at the ‘Irish Famine Memorial, Sydney’. 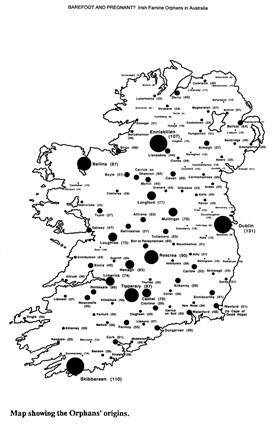 According to them young women who came to the Australian colonies during the Famine years of 1848 to 1850 were from workhouses in all 32 counties throughout Ireland including 25 from Ballinrobe. All were destitute and many had lost their parents and families, so were orphans in the modern sense of the word. Others were simply unable to support themselves within the family. However, the term ‘orphan’, meaning loss of at least one parent, did apply to the vast majority of the 4114 who took up the offer under Earl Grey’s Famine Orphan Scheme. This page was added by Averil Staunton on 24/11/2014. I've finished my dissertation on the Mayo Orphan Girls and have summarised the information on a website: mayoorphangirls.weebly.com. I've identified 22 girls who I believe were from the Ballinrobe workhouse (official records show that 25 girls were sent). 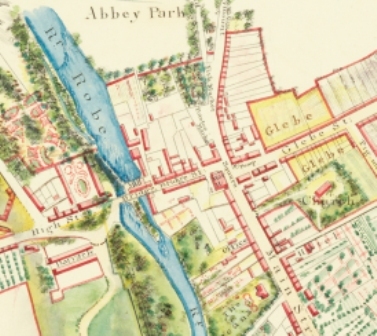 Many gave their 'native place' as Ballinrobe; this could have meant their last location (i.e. the workhouse) or that they were from Ballinrobe itself. Some girls gave the parish name - Kilcommon - and some gave town/townland names, such as Robeen, Hollymount, and Neale. The girls surnames include Crean, Joyce, Sheridan and Walsh. I've only located stories in Australia for two of the Ballinrobe girls so far - Mary Duddy and Catherine Ferris. I know there are many other girls who have descendants in Australia - getting in contact with them is my next step. That page also links to other pages on the site, including details of the scheme, and the ship the Ballinrobe girls sailed on, the Panama, which arrived in Sydney in January 1850. I would love to hear from anyone who has any questions about the scheme, or might know anything about the girls. My contact details are on the site. Congratulations, this is a wonderful work. While a sad story, in some cases, you did a lot of research, have great links, cited a lot of authors. In order to assist in giving a wider audience to your query I have put some extracts up on the main page of this website with links back to the full story on your website. Thank you for your great work in bringing this story to Mayo and its Diaspora worldwide. I'm sure you will get great results which are well deserved. I'll certainly let you know if I uncover any of the stories of the 25 Ballinrobe orphan girls. I am researching the 137 girls sent to Australia from Mayo workhouses as part of this scheme, including the 25 from Ballinrobe, for my final year dissertation in Heritage Studies at GMIT Mayo Campus.